A guided visualisation empowering your immune system to release the weak disorientated cancer cells with emotional issues and feelings trapped inside. You are then guided to your Celestial healing realm where, you allow your white cells to rejuvenate and regenerate, enabling you to replace stress with hope, courage, joy and happiness. 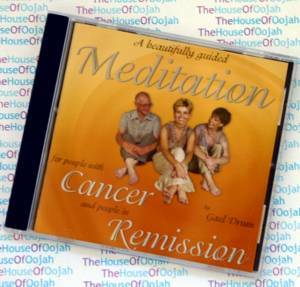 - a meditation also for people in remission. Safely relaxing and releasing any cares and concerns you are gently guided into your body to pain or tension, allowing yourself to come to an understanding with the person most relevant to these feelings. You then float to your euphoric realm where you experience peace, stillness and love. Gael Drum is one of Australia's leading authorities on work/life balance. She is an author and professional speaker who speaks to CEOs, managers, professionals, business owners and staff who are working in a business environment that’s tough, fast and constantly changing. Gael gained her business and psychology education from the University of 'Life Experiences'. Over three decades she owned and operated very successful hair and beauty salons and health and wellbeing businesses, whilst juggling a growing family. As a mother of 4 and working with people on all levels as an owner operator, employer and technician, she became an authority on human behaviour. Gael authored the book 'Beyond Burnout to Balance' and created a Relaxation and Wellbeing CD series, which are available in all good book stores and recommended nationally by doctors and health practioners. She has many published articles in business and health magazines, and has been a regular columnist for a national magazine. Gael is passionate about helping people, which makes her connect very quickly and easily with her audience. She inspires them and leaves them feeling good about themselves, their employers and their future.